If you are looking for a delicious food gift that’s not loaded with sugar, you’ve come to the right place. I love giving food as a gift, but I sometimes get overwhelmed with the sweetness factor. Cookies, caramels, and candies are great… in moderation. But a cheese ball – a savory one or a sweet one like this – is a refreshing option. First of all, cheese balls are a treat. I mean, how often do you make a cheese ball for yourself? Second, cheese balls aren’t sickeningly sweet. And third, cheese balls are low cost. This one cost right around $3.00 to make. This recipe is a winner whether you give it as a gift, serve it at a party, or eat it yourself. A homemade cheese ball makes a great hostess gift, as well as a gift for a teacher, neighbor, or coworker. Using a mandoline slicer set at the 2nd thinnest setting, slice whole pears. Do not remove the skin or seeds before slicing. (If you don’t have a mandoline slicer, you can use a knife. Just make sure all slices are approximately the same thickness). Preheat oven to 225F. Line a baking sheet with parchment paper. You should be able to get slices from 2 whole pears onto one baking sheet. Bake for 45 minutes to 1 hour. Flip and return to oven to bake for an additional 30 minutes or so. Watch closely toward the end to make sure the pears don’t burn. Remove from oven, cool, and eat or package. Tip: I bought a package of organic Bartlett pears from Trader Joe’s for $2.99. I used 2 pears that were quite firm to the touch. This yielded enough 2 people. Like what you see? Follow along on Instagram for more visuals, blog updates, and other fun stuff. Optional: Toast the almond slices for an extra nutty flavor. You can also use chopped pecans or walnuts. Nut allergy? 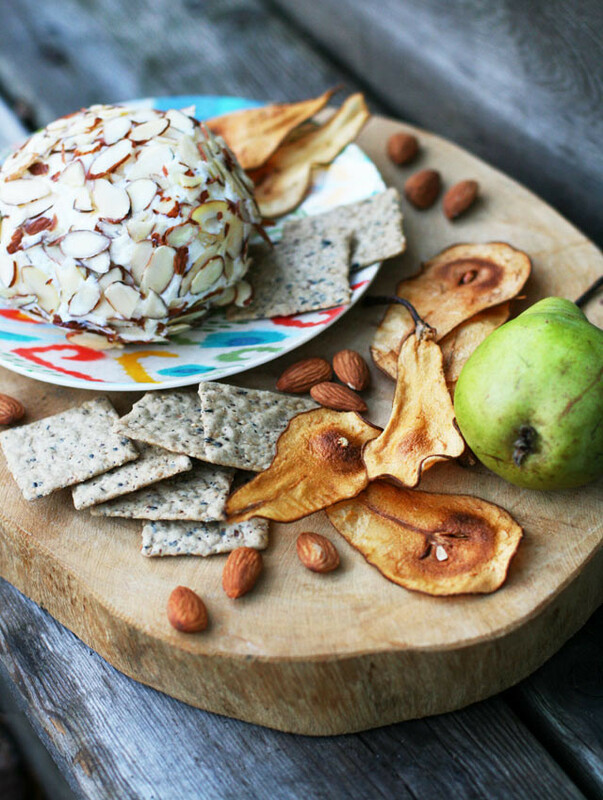 Roll this cheese ball in chopped banana chips right before serving. Mix cream cheese, powdered sugar, vanilla, pineapple, and lemon zest in a mixing bowl. Place in the fridge for at least an hour to harden. Place sliced almonds on a piece of plastic wrap or parchment paper. Make the cream cheese mixture into a ball: I find that this is easiest done with damp hands. Take cream cheese mixture and carefully form it into a ball. Roll the ball in sliced almonds. Place on a serving plate or wrap in Saran wrap and place in the fridge. Serve with homemade pear chips, cinnamon pita chips or crackers.